When Sam Cartner and a few others set out their first Christmas tree seedlings in 1959, more than one of their farming neighbors thought they were crazy. Now, forty years later, they have realized that Cartner was crazy like a fox, and many of them have gone into the business themselves. Cartner runs the Cartner Christmas Tree Farm on Spanish Oak Road in Newland, but the enterprise is so large that he can’t do it alone. His three sons and wife still help in the business, along with between eight and seventeen workers, depending on the season. In the mid-70’s, more people got interested in the business after seeing the success of the tree pioneers. “It was something new,” Cartner says. This year the farm will ship to Minnesota, Texas, Missouri, Colorado, Louisiana, Alabama and other markets. They don’t ship to local markets and work with a Winston-Salem-based distributor to get the trees across the country. That first group was small, but were lookin toward the future. “There probably weren’t more than ten or fifteen people who were beginning to think. Cartner says there were very few options for farmers in those days, and getting money from their land was looking harder and harder to do. “We were just looking for something so we could use this steep, rough land to give people an extra source of income. Our first planting, we planted every species we could find. We planted both Norway and Siberian spruce, white pine, Scotch pine. Cartner says that while the wholesale cost of trees has increased, so has all the costs, particularly labor. Other trends have emerged as well. 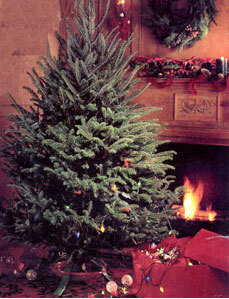 “It takes about thirty-three million cut Christmas trees of all species to furnish all the market,” he says. “We’ve gotten about fifteen to seventeen percent of that market now, when you talk about the Fraser firs that are cut from Virginia down to Georgia across the mountains. We hope we can get twenty-five percent of the market. We don’t want it all, because we couldn’t produce it. It’s the land area that’s the limiting factor. The Cartners work year-round in the trees, with eight full-time employees; They grow the seedlings from plugs, then plant them in the fields after two years. The trees are replaced with seedlings as they are cut. Unlike many growers, the Cartners are more selective in their cutting, taking trees that are the sizes demanded by the marketing while leaving others to grow a little more. Cartner advises that this year’s shoppers might be faced with shortages in several size areas of trees, particularly the six-and-sevens and the over-nine footers. The Cartner’s tree farm is between 3,500 and 4,500 feet in elevation. His sons are all successful in other professions, but take time off in the shipping season to help out the family business. Cartner’s sons include a professor, a lawyer, and a veterinarian. That’s proof enough that it doesn’t necessarily take brains to be a Christmastree farmer, but it does if you’re going to be successful. And it helps to have a little foresight. Sam Cartner has both.